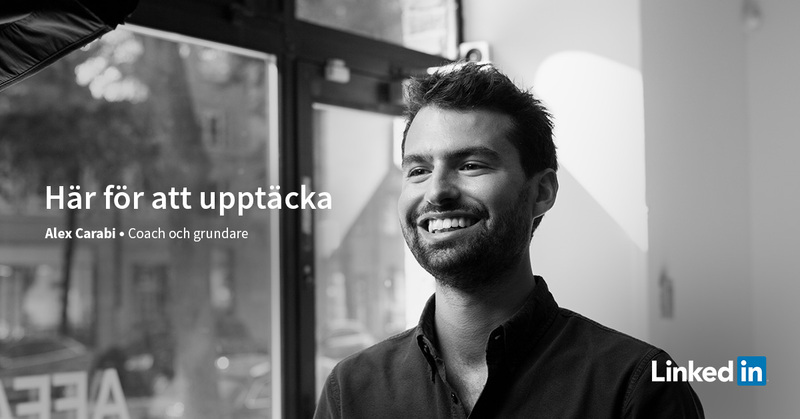 This post is part of LinkedIn Sweden’s #inittogether campaign. Marco Polo. Christopher Columbus. Marie Curie. Albert Einstein. Amelia Earhart. Neil Armstrong. Jane Goodall. These names are the stuff of legends. Their stories evoke notions of adventure, peril and intrigue. They are figureheads who have pushed the world forward by pushing themselves ahead. We associate these discoverers with an almost myth-like status. But the truth is that the act of discovery is not limited to these heroes of history. We are all discoverers. Granted, our discoveries might be smaller in the grand scheme of things — but we still have the possibility to explore the undiscovered, each and every day. When we try new things, we discover new abilities. When we’re surrounded by unfamiliar cultures, we discover new connections. When we push ourselves in uncharted territory, we discover more about who we are and what we’re capable of. As a coach, I support ambitious and impact-driven people on their own journeys of discovery. I help them to discover what they want. I help them to discover what they’re willing to give to get there. And I help them to discover more of themselves along the way. As a business owner, I’m on the endless path of discovery myself. Discovering new opportunities and new services to offer. Discovering where my own boundaries and breaking points are. And discovering more about who I am and who I want to be. The act of discovery has a romantic, adventurous feel to it. And although it does have certain storybook qualities, it can also be a gut-wrenching affair. Why is it so difficult? The reason is that discovery demands two completely different time perspectives. I call it the dual vision of discovery. The dual vision of discovery is the ability to both look up and look down, at the same time. Looking up means having a long-term direction. You need to set a course and head toward that point on the horizon. You need to think ahead, with patience and fortitude. You need to lift your gaze, and keep one eye on the future. But you also need to look down at what’s immediately in front of you. You need to approach tasks with diligence and concentration. You need to do your best with what’s in front of you. You need to keep your head down, with one eye firmly on the present. Throughout my entrepreneurial career, I’ve come to learn that this dual time perspective is crucial. Without dual vision, you’re toast. All forms of creation, discovery or entrepreneurship require looking up and looking down at the same time. If you only look down at what’s in front of you, you’ll run out of motivation. You’ll lose the big picture. And you’ll get sucked into a whirlpool of busyness without getting anywhere. On the other hand, if you only look up toward the future, you’ll become blind to what needs to be done right now. You’ll get caught up in grandiose dreams and visions. And you’ll lose touch with reality. Even though I know that dual vision is crucial, it’s still difficult to remind myself of its importance. It’s tough to remain optimistic when things don’t go as planned. It’s frustrating to keep ploughing ahead with a marketing campaign when you’re unsure of what it will lead to. It can feel pointless to keep writing blog posts when you don’t know whether anyone will read them. This is why dual vision is so important. Impact is created in the daily grind. The seeds of change are planted in the present. But often—in fact, most of the time—you don’t see the fruits of your labor until weeks, months or even years later. So you must set a long-term direction for what you want to achieve. If you were to only think in the present moment, you would stop because of the heartache. You would stop because of the obstacles, setbacks and pain. You would stop because of the No’s, Maybe’s, and Later’s you inevitably receive from others and from yourself. The name of my company, Kodawari, is a testament to this dual time perspective. It’s a Japanese word that means, approximately, “a sincere, unwavering focus on what you are doing, with the intent of making it perfect, while knowing that perfection is impossible and that the work itself is most crucial.” In other words: the mastery of discovery. Coaching is ostensibly about setting goals and achieving results. But this is a drastic oversimplification. The truth is that things change. Reality intervenes. New goals become more important, new circumstances arise, and new constraints need to be taken into account. But there is one thing that will never change, and that’s the path of discovery. And it’s a path that requires looking up and looking down. Wherever it may lead, there’s always more to discover: of oneself, of others, and of life. I’m in it for discovery.